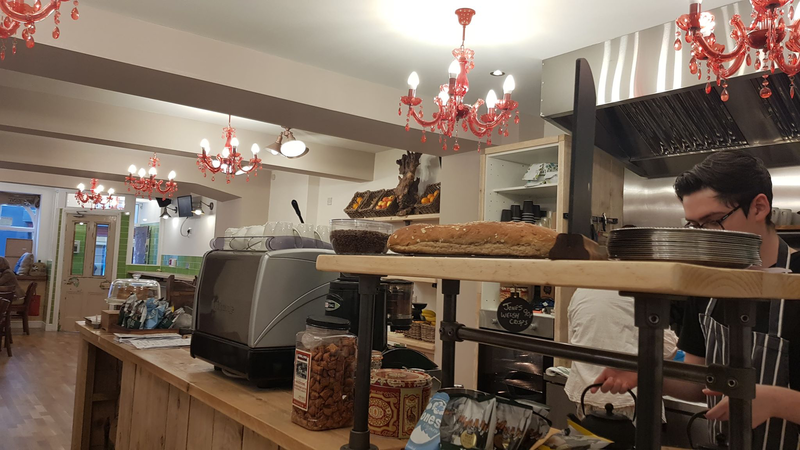 The arrival of Domu Kafe has been largely anticipated – located 206 High Street, Bangor, this renovation connects Bangor’s past and future together. The newest edition to Bangor’s ever-growing Vegetarian and Vegan scene is finally here in the form of Domu Kafe. The name of the restaurant itself is translated from Czech means ‘home’. 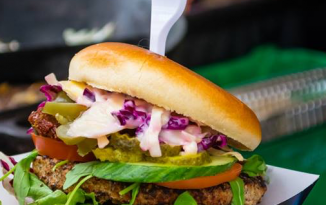 Run by husband and wife: Dale and Svet, this family run coffee house prides itself on its originality and highly refined recipes, not to mention the delicious food! Specialising in their coffees, their coffee menu features an extensive list of the exotic and the unusual. Domu is also home to loose leaf teas, tea tisanes (infusions), and fresh made juice! Using freshly made ingredients delivered daily, all menus are devised from these; no day’s going to be the same! Their range of sweet treats are available to eat in or to go, so for students in a hurry en route to lecture they cater to you! Alternatively, if you fancy a sit down winter-warmer, then pull up a chair and relax. This beautiful hideaway features some rustic feels including coffee bags labelled from Colombia and some easy feel music to relax while peering into the ever busy high street. I was given the opportunity to sit down and try a few of their dishes; first of all I had an espresso, followed by the Vegan Yufka (mild coconut curry with diced vegetables, chickpeas, cashews and seeds wrapped in a filo pastry), and to end the Coffee and Mint tiffin. 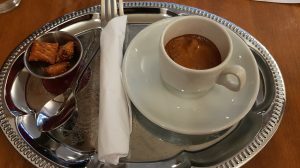 I was first served the expresso on a beautifully engraved silver platter with a selection of peanut butter pretzels, added a real kick to my day and the pretzels were to die for. The Yufka was served fresh out the oven with a selection of salad and heated cous cous was exquisite, the different flavours and textures were delightful and accompanied with the extras just made for that filling sensation. I was stuffed! Ended up taking my tiffin home as my eyes were obviously bigger than my belly, enjoyed this treat wrapped up in my duvet with a film on in the background. This delicious blend combine after 8’s and coffee cake into one gorgeous feature. 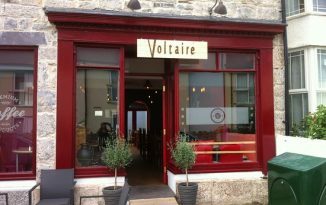 A fantastic experience and a must try down in Bangor High Street, you’d be crazy not to! 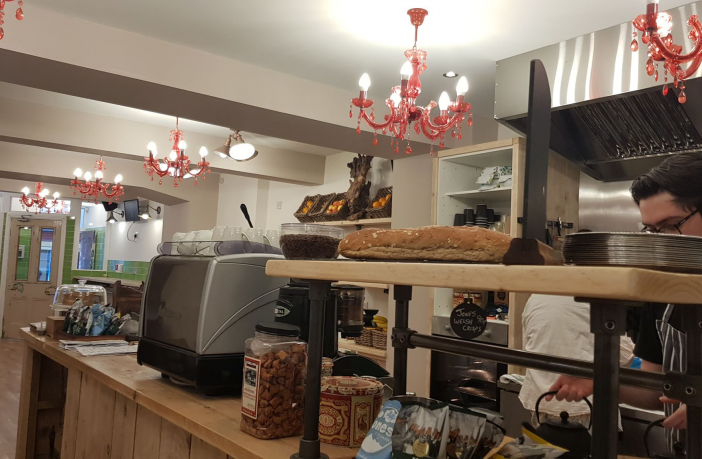 Domu, a small, friendly, family-run café, found a few doors up from the costume shop on the High Street, is one of Bangor’s newest additions. 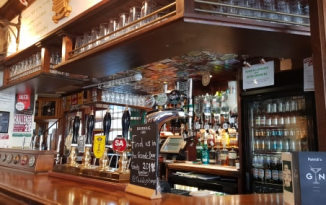 The Café, run by Svet and Dale Hibbert (former member of The Smiths), is in a restored pub, although you’d never be able to tell! The place is beautifully restored, with modern additions and a bit of weathering here and there to make it look a bit more rustic. Apparently a vestibule was added too, to make sure a draught from outside was avoided – or so Svet tells me. As soon as you walk in, you’re greeted by the smiles of the manageress, Svet, a friendly, chatty woman who will try to remember your name (she’s almost got mine! ), and will ask with genuine interest as to how you are. Every Friday morning I’ll go in for about an hour with my friend for a cuppa and a chat, and I honestly couldn’t think of a better place to go! With a massive selection of teas, I’m slowly making my way through them all, but I find myself always returning to the Mumbai Railway Chai – a welcome spicy treat in this horrible weather! With food to accommodate all (tasty vegan options that I’d recommend to even the most meat-loving people), Domu is definitely worth giving a visit.